The Heavenly Holy Grail is associated with the constellation Virgo. Each year during the period when the Sun is in the sign Aries, normally from March 20-April 20, the "Easter" Full Moon travels through the heavens with Spica, the brightest star of Virgo the Virgin. During this time The Aries Full Moon Festival is celebrated. It is a Festival of the Risen One ~ The Cosmic Christ ~ The Full Moon Festival of Easter. The Heavenly Holy Grail hosts this Full Moon Festival and tunes humanity to its essential Divinity. The following describes what is written in the heavens and its significance to humanity's ongoing evolution. Esoterically, the emanations of Virgo, the Virgin nurture and shield the hidden divinity of each one of us until the gestation period is complete and spiritual birth can occur. She is the celestial Chalice for the Divine Host. The brightest star in the constellation Bootes is a golden star located above (north of) Spica in the night sky. See the map above. This luminary is Arcturus, the herder of the Divine Will emanating from the 7 stars of the Big Dipper in the constellation, Ursa Major. Arcturus is the bridge between these 7 stars and Virgo the Virgin. Arcturus, like an Avatar filled with Divine Will, stimulates great evolutionary changes to all in its path. 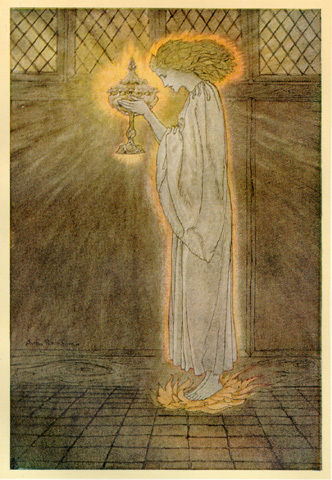 Virgo, in its path (see map above), is the Holy Grail that receives the Will of God. Spica representing the sacred womb of Virgo the Virgin, accepts and nourishes the seed of Arcturus, until the gestation period is complete and spiritual birth can occur within the human form. Virgo the Virgin nourishes the seed of our innate divinity and spiritual awareness until the Christed ONE within us can be born. It's as if Arcturus, symbolizing the soul, steps down and transmits the Will of God into the form (Virgo) and its individual personality. The personality becomes the receiver and container of this Divine Life. This eventually results in the birth of the Christ consciousness on Earth and the evolution of matter. The seven stars of the Big Dipper are esoterically known as the Seven Rishis and correspond to the head centers in the body of a Great Being. Each of these stars transmits a ray of energy into our solar system. These seven rays are the givers of life to all on this earth. In the springtime during the three major planetary festivals, the Big Dipper can be seen overhead in the early evening pouring out its heavenly contents upon an awakening earth. Note: Alcor, a small star in the bend of the Dipper's handle, difficult to see by many with the unaided eye, is not considered a Rishi. 1st Full Moon of the 2019 "Easter Season"
Annually, Virgo the Virgin, our Heavenly Holy Grail, hosts the "Easter Season" Full Moon for all parts of the world. Whenever any phase of the Moon is located in the Virgin's constellation, it affirms and fosters a deep growing awareness of the importance of world service on Earth. Look Up! Find the Full Moon. Can you spot bright Spica? Helpful Image Arc from the handle of the Big dipper to golden Arcturus and then spike down to blue-white sparkling Spica in the south. Virgo with its brightest star Spica, along with the Full Moon of the "Easter Season" are arousing and awakening our inner divine nature, our unfolding Christ consciousness. These celestial bodies are impressing us to nourish our innate divinity and spiritual awareness, in order to be reborn anew. We are being urged to change the order of our lives, so that we may ultimately give rise to the HU-man *, the Christed ONE, Homo Luminous and in turn, birth a sacred planet. 2nd Full Moon of the 2019 "Easter Season"
When there are two Full Moons during the period when the Sun is in the sign Aries, the first Full Moon is generally considered to be the more potent of the two and would be the one dedicated to the Aries Full Moon Festival celebrating Easter. Note: In 2019 each "Easter Season" Full Moon has its own unique potency. The 1st Full Moon is the gateway of this Holy Season. It is also a supermoon that falls on the equinox, another gateway to a new cycle of life. The 2nd Full Moon happens to fall on Good Friday, the same day that Passover starts at sunset, and it occurs two days before Easter Sunday. The 2nd Full Moon, as it travels through the heavens, is positioned closer to Spica than the 1st Full Moon, emphasizing our innate Divinity and Divine Will. Each year during the time of Aries, opposite the "Easter" Full Moon in the Holy Grail, we find the Sun in the constellation Pisces, a constellation that is associated with the World Savior. Pegasus ~ "The Doorway to Paradise"
Note: The Sun associated with the Easter Festival lies in the constellation of the World Savior, Pisces, for all parts of the world. It is interesting to note that the constellation of the World Savior, Pisces, lies beneath (south of) the Square of Pegasus. See map above. The ancient Babylonians called this square "The Doorway to Paradise." Today astronomers travel through this doorway or "window" to the edge of our Milky Way Galaxy and go beyond to other galaxies! As the Light of the World, the World Savior frees humanity from subservience to the form, and the darkness of matter ends forever. Then the Doorway to Paradise opens and new dimensions of reality are experienced. It Is Written in the Heavens! Virgo the Virgin's Holy Grail and Easter's Full Moon nourish the Divine consciousness in form. Pisces the World Savior and the Sun opposite Easter's Full Moon free the Spirit from the limitations of form. This dual relationship is an illustration that the path leading to light is trodden through the blending of the pairs of opposites. Each year the Holy Grail, with the Full Moons close proximity to Spica, has the potential to stimulate and consecrate the seed of divinity within each and every one of us. Any planets in the Holy Grail uniquely augment the message of Virgo the Virgin. The Easter Full Moon Festival gives humanity an opportunity for divine awakening. Each year the message of the World Savior, opposite the "Easter" Full Moon, is emphasized, enlivened and carried throughout the solar system by the rays and power of the Sun. Any planets in the constellation Pisces uniquely augment the message of the World Savior. Their message is also enlivened and carried throughout the solar system by the rays and power of the Sun. Pisces and Pegasus are helping humanity's transfiguration take place. With their assistance we can focus our Life Force and open the Doorway to Paradise, to new dimensions of reality. Call upon these celestial energies for guidance and empowerment. The Light returns through you, a self-consecrated human being, who pursues the soul's purpose and is a manifestation of the Divine on Earth. This truly is a time of rising. It is written in the heavens! Pisces the World Savior by day, the Full Moon and Virgo the Virgin's Holy Grail by night are working together to bring about Christ in You the Hope of Glory! Look Up! See Easter's Full Moon travel through the heavens in the constellation Virgo the Virgin, the heavenly Holy Grail, the celestial Chalice. Become a sacred vessel that receives the radiant Life and be a Light of the World! Join with others around the globe who are creating a grid of Light, the Holy Grail on Earth. Together become the Risen ONE giving birth to a sacred planet. We are the Chalice for the Divine Host on Earth. Check out the following sites to see when the "Easter Season" Full Moon and Sun rise and set in your area. See if they are joined by any bright planets in Virgo's Heavenly Holy Grail or in Pisces the World Savior. See The Planets in Esoteric Astrology ... Scroll 1/2 way down page to learn about each planet as well as the significance of each planet positioned in a sign / constellation.